The Weslo Cadence C22 treadmill is priced below $200. And with a price tag like that, expect to get an extremely low quality treadmill. No. I don’t think this treadmill is for anyone. If you’re short on the budget, I suggest you visit our best buy treadmills page and look for other budget treadmills. I don’t recommend this model. This treadmill offers a 1.0 HP motor to give you speeds that reaches only up to 5 mph. A motor with this power is only good for light walking. It comes with a 13-inch x 40-inch tread belt. I don’t think a lot of people would be comfortable even walking on this small surface. The The Step-by-Step™ Workout Console lets you keep track of your speed, time, distance, calories and fat calories burned. 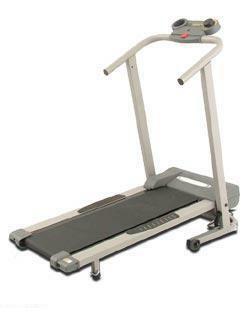 The manual incline allows you to increase the intensity of your walk. This treadmill comes with 3 incline lock positions (5%, 7%, 9%). The more incline the treadmill is the harder the workout. One positive feature the Weslo Cadence C22 treadmill has is that it is foldable. It’s built with SpaceSaver® Technology so you can easily fold this treadmill to save space in your home. I don’t recommend this treadmill. Period! See our best buy treadmills page and look for better alternatives to this unit.